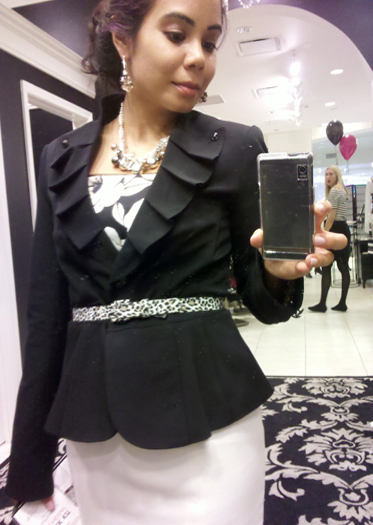 The had two looks put together for me, both which were fab and had me rock midi pencil skirts - so on trend for fall. I adored my first look, which felt tres "Mad Men" to me! Alas, I forgot the memory card for my nice camera, so here is my camera phone pic! 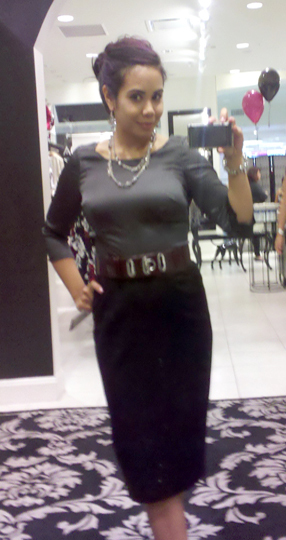 I'm wearing a midi pencil skirt , fitted pindot top that I may go back for, and a cute purple croc texture belt. Now, while I did really like my looks, I'm quite surprised that they didn't ask us to style one of our own! I know WH|BM does a lot of helping other people put together looks, throwing in a fun, fresh perspective that's personal would have made this experience much more compelling for everyone. It would have been a story instead of an ending, you know? My only other comment on this experience is that we actually were handed flyers and told to go around the mall promoting the discount and whatnot. It's one thing to do some free modeling for funsies, but quite another to turn into a walking ad... I knew there would be a gift at the end of the night, and I had hoped it would make it worth it but, alas, it was a tote bag. A nice, sturdy one of thick plastic, but I've been going to fashion evens for years now and if there is one single thing I could possibly need less, it's another tote bag! I seriously leave about five in my room when coming home from NY fashion week, and I still have a zillion! If White House | Black market had provided a piece of jewelry or a gift card, you would at see their clothing in my future outfit posts and there would have been a win - win. Instead, there was this one post and the possibility of my future involvement with the brand... as long as there's no walking!